Please note that a motor must be sent for exchange. 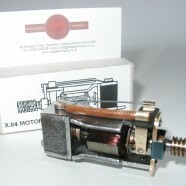 Motors must be complete including carbon brushes (even if completely worn down) and spring. The worm gear will be returned on the refurbished motor wherever possible.‪ Missing parts can be replaced at extra cost. I am now able to refurbish the X.04/R55 motor that powered the very early R55 Transcontinental diesel. Tooling has been produced to remove the gear from the armature as my existing worm puller was too small for this job. Price is the same as a conventional X.04 at £21.00 inclusive of postage. I can also work on 5 Pole “airfix” type replacement motors, but cannot rewind armatures for these. If a 5 pole motor is sent for refurb and it proves that the armature is blown then a 3 pole version will have to be substituted. 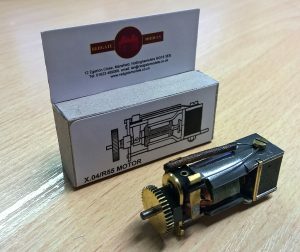 Motors are not new, all parts are refurbished/exchanged as necessary. Armatures are tested to original spec and rewound if necessary. Magnets are either remagnetised or replaced with modern neodymium magnets if preferred. Due to fluctuations in part availability carbon brushes may be supplied using an alternative material that may not be identical to original spec. Fantastic job, quickly done & well worth it! Hi there Ian! I received the motor today as you predicted. I did not know what to expect, WOW! A very bright and shiny motor. I loved the little box. Its now installed back into the M7 and runs very well. Thank you for a very good service, I know where to come next time.